One of the comments we receive frequently from out-of-town visitors or new MetroLink passengers is just how clean our light rail trains are. That’s because our trains are cleaned daily, inside and out. We thought you might enjoy a behind-the-scenes look at our car wash for MetroLink trains so we taped a camera to the train windshield and took video at the same time from the train wash platform. So, here’s how it works. When a MetroLink train finishes service for the day, we run it through the train wash. Trains get washed every day, unless the temperatures are near or below freezing. The train wash uses a special balanced cleaner and motorized brushes to scrub the exterior. Instead of using an massive commercial blower like you’d find at the car wash, the exterior windows are squeegeed and the train is parked outside to air dry. Once the outside is sparkling clean, the focus shifts to the interior of the train. All handhold surfaces are treated with disinfectant. The walls and glass are washed. Floors are swept and mopped, and the seats are cleaned and treated for stains. 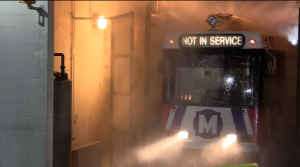 From start to finish, it generally takes less than an hour for crews to clean one MetroLink train. Once the inside is done, the train is parked in the MetroLink yard and is ready to be put back into service. These daily cleanings keep MetroLink trains neat and tidy. But sometimes, the trains need a little extra attention. In those cases, trains go through a deeper, more detailed cleaning. In addition to the regular cleaning process, detailed cleanings take care of areas that are not part of the daily cleanings, such as the ceiling, air vents, light lenses and more. On average, each MetroLink train will go through a detailed cleaning every three to four months of service, depending upon its operating schedule. So you may be wondering, what about the combination of electricity and water. Not a problem. Each train moves through the train wash under its own power. The electricity from the overhead catenary system travels through the train and returns via the track. As long as the train stays on the track, there is always a return path for electricity (and a way to keep our trains looking like new).